In my last video report I discussed the 2 possibilities or the Wave counts that can take place. The last article suggested that either the Wave 2 in Gold was completed at 1240 and it has started the Wave 3 and is in Wave 2 of Wave 3. The second probability was that it was in a Flat correction. 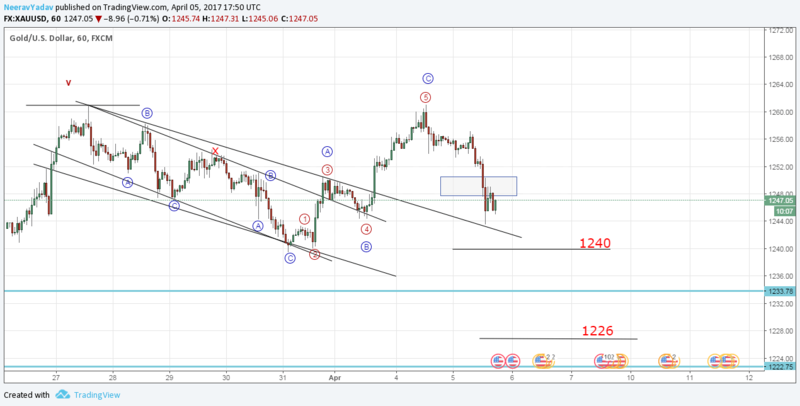 Gold has attained the first suggested target that is 1247, breached it and seems to be treating 1247 – 1250 region as resistance, this suggests to me that the Wave is progressing as a Wave C and only once it goes a little below 1240 can we think of the Flat pattern getting completed. Note : If the market moves above the boxed zone and takes it as support then the probabilities would suggest long side trades.